This New Orleans cake is slightly sweet and topped with a simple icing made of powdered sugar and water. For Mardi Gras celebrations, many people sprinkle the top with colored sugars in purple, green and yellow. In addition to the decoration, what sets a Mardi Gras cake apart from others baked year round is that a porcelain or plastic baby is baked inside. The person who gets the piece of cake with the baby is supposedly set up for a year of good luck – and has to make the cake for next year’s celebration! 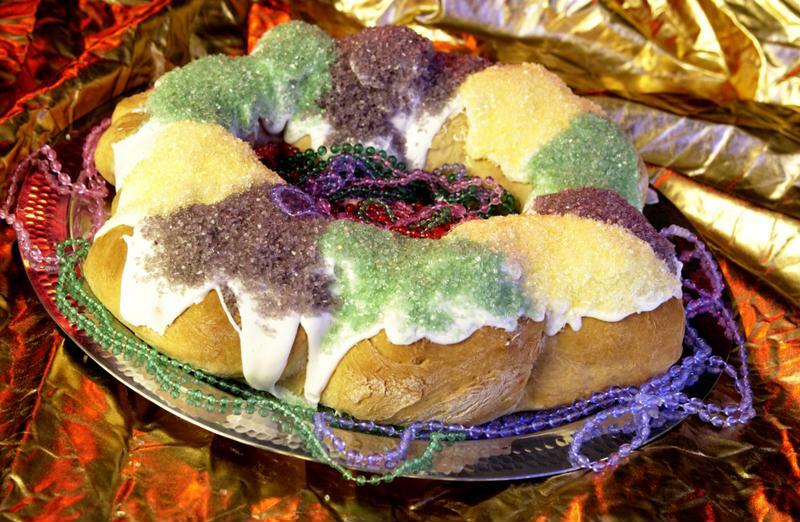 Try this simple king cake recipe from All Recipes. The perfect dinner for a Fat Tuesday celebration is a New Orleans classic – jambalaya. Spicy and flavorful, there’s a reason that it’s not just made on Mardi Gras. This recipe from the Food Network calls for andouille sausage, smoked ham and shrimp, so there’s no shortage of protein. Flavor this stew with a combination of garlic, jalapenos, onions and bell peppers, in addition to strong herbs and spices like cayenne, oregano, thyme and pepper. You can toss your ingredients into a slow cooker to let them simmer all day or prepare it on the stove right before your party! ​If there’s any Polish in you, you’ve probably referred to Fat Tuesday by yet another alternative name – Paczki Day. This name comes from the very rich Polish doughnuts that were traditionally made before Lent to use up the butter, lard and oil that weren’t to be eaten the next 40 days. This recipe from Seasons and Suppers suggests stuffing your paczkis with raspberry, blueberry, cherry or strawberry jam. Though custard wasn’t usually used in traditional paczkis, it’s become a popular filling for modern-day doughnuts.